GSA rated for 24 hour intensive use! 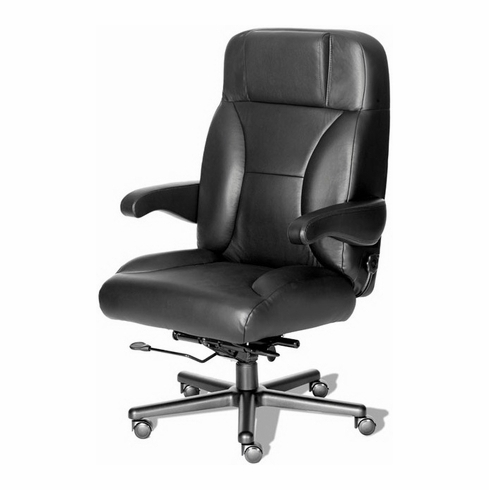 This big and tall ERA Products office chair is so top-of-the-line, the only appropriate name for it is “The Chief.” It has features galore, including adjustable lumbar support, premium contoured cushions, a rocker reclining seat back, adjustable seat depth, and a floating spring seat suspension. It’s also fully adjustable, and the arms flip up for easy entry and exit. Each chair is individually crafted when you order, rated for up to 500 pounds, and backed by a limited lifetime warranty. You can choose commercial grade vinyl upholstery, stain-resistant fabric, leather with mock leather matching trim, or even upgrade to all-leather.